Pictured is a large coyote spotted in the front yard of a Lakewood Drive property Wednesday morning. Cathy Curley took the photo from a window of her home. 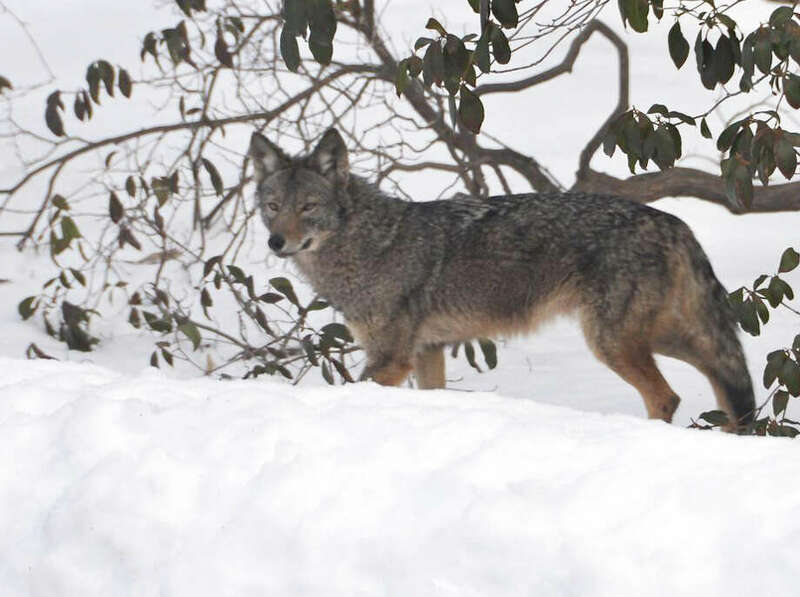 Hampered by heavy snow in their search for food, coyotes that roam Fairfield and Westport are hungry. And animal control officers are warning residents they should protect their pets and make their property less attractive to the predatory scavengers. Although coyotes rarely attack adult humans, wildlife officials say, the wolf's smaller cousins often are attracted to small dogs and other pets -- sometimes even small children. Any food source left outside, including bird seed, can draw coyotes into residential yards, officials say. People who see coyotes on their property should keep a safe distance, both because the animals could be rabid and because they can be unpredictable, according to Westport Animal Control Officer Peter D'Amico. He urged people to report any sighting to their town's animal control department. In Fairfield, Cathy Curley spotted two German Shepherd-size coyotes in her Lakewood Drive yard one morning recently, just before her sons headed off to school. Seeing coyotes isn't a new experience for Curley, but one thing grabbed her attention. "These were the biggest we've ever seen," she said. COYOTES AMONG US Here are some things to know about coyotes, based on data from the state Department of Environmental Protection and local animal-control departments. Coyote or dog? : A coyote resembles a small, lanky German shepherd. But the coyote is thinner, with wide, pointed ears; a long, tapered muzzle; yellow eyes, and a straight, bushy tail carried low to the ground. Fur most often is grizzled gray, but can be brown or red. Measure 4 to 5 feet from nose to tail. Habitat and diet: Highly adaptable. The animals tend to favor wooded suburbs, but are seen in office parks and downtowns. Diet consists mostly of mice, woodchucks, squirrels, rabbits, deer, some fruits and garbage when available. Cats and dogs less than 30 pounds are vulnerable to attack. Protecting pets: Keep cats indoors, especially at night. Keep small dogs on a leash and under close supervision at all times. Installation of a kennel or coyote-proof fencing is a long-term solution. Coyote magnets: Unsecured garbage, pet food, table scraps on compost piles, fallen fruit under trees. Bird seed on ground under feeders attracts squirrels and cats, which attract coyotes. Hunting or trapping: Allowed but highly regulated; poses danger to humans and pets in residential areas. If you see one: Stay at a safe distance. Make noise by banging pots and pans, blowing a horn or shouting to let the coyote know it's not welcome there. Contact local animal control department. Fairfield: 203-254-4857. Westport: 203-341-5076. "They looked like wolves. Their eyes are just very intense. Their faces and the size of these guys, they have a wolf look," she said. Although coyotes can look scary, Fairfield Assistant Animal Control Officer Vinny Pennatto said the animals actually are more afraid of humans than humans are of them. What should you do if a coyote shows up in your yard? "Make your presence known," Pennatto said, don't just watch from behind a window and allow it to roam in your yard. Step outside, he said, and from a safe distance, "Bang pots and pans to let them know you don't want them there." Pennatto advised not to leave out food sources, such as unsecured garbage or bird feeders. Bird feeders can attract squirrels and cats, which in turn can attract coyotes. People who walk their dogs -- whether in wooded areas or the neighborhood -- should carry citronella spray, which could ward off an attack if a coyote is so bold, he said. The snowfall has made it harder for coyotes to find food, Pennatto said. "They're opportunists. They'll take what they take when they can get it." Pennatto said he doubts the deep snow has forced coyotes into closer contact with humans. Rather, he thinks the snow has hindered their ability to blend into the environment and, as a result, people are noticing them more. And Fairfield residents are reporting them more. Reached by phone just before 9:30 a.m. one recent day, Pennatto said he already had received three reports of coyote sightings that morning. There are no particular areas of Fairfield where the animals seem more prevalent, he said. Sightings have been reported all over town, including downtown. "A pair will cover a 10-mile radius," said Pennatto. "They don't normally travel in a pack, but you may see a family. When they reach 2 years old, they usually go off on their own." Unlike Fairfield, recent reports of coyote sightings are not piling up in Westport, D'Amico said. He recalled only two calls this winter, the most recent in early January. While wildlife officials say coyotes usually do not form packs, Curley said she and her neighbors often are awakened during the night by what sounds like a pack howling. "We often compare notes, asking, `Did you hear them last night?' " Curley said. And while the snow may have impeded the coyotes' search for food, Curley said those seen in her Lake Hills neighborhood, based on their size, must have gotten at least a few good meals this winter. And she speculated about what might have been on the menu. "In previous years, we had a large family of turkeys that always came through," she said. "But we haven't seen them at all. Sometimes there would be as many as five to eight. Maybe the coyotes had some nice Thanksgiving dinners." Small pets left unattended also can be easy prey for coyotes, D'Amico said. People who leave small dogs in their yards, surrounded by an electric fence, when they go out on errands may return to find their pets gone. The Curleys family dog, Duffy, is a 13-pound Havanese. Duffy no longer ventures outside alone, and just in case a coyote was to approach, the family keeps a baseball bat at the ready. At 10 and 12, Curley's sons are not small, but she is more cautious now when they play outside in the neighborhood. They used to stay out after dark, as late as 7 p.m. Now, she said, they must be in the house by 5 p.m.
Two days after Curley spotted two coyotes in her yard, a friend on Putting Green Road told her a neighbor had found the remains of the family cat in the backyard. They suspect a coyote attack. Pennatto said the incident was not reported to his office, In fact, he's received no reports this winter of coyote attacks on cats. All reports of attacks are referred to the state Department of Environmental Protection, he said. Coyotes have seen been in Westport for at least 15 years, D'Amico said. A little more than a decade ago, he recalled, he responded to a report that a couple of coyotes had brought down an injured doe that was hit by a car. As he approached, the coyotes ran off. Though coyotes tend not to be dangerous to humans, D'Amico stressed that witnesses should always call the local animal control department. "Stay away; let the professionals handle it," he said. "We'll document it and go out to the scene." Fairfield's Pennato had similar advice. If someone encounters a coyote in the yard that is sick or injured, is acting unusual or isn't scared off easily, he or she should call Fairfield Animal Control, he said.